The northern lights will be visible tonight above parts of the US. 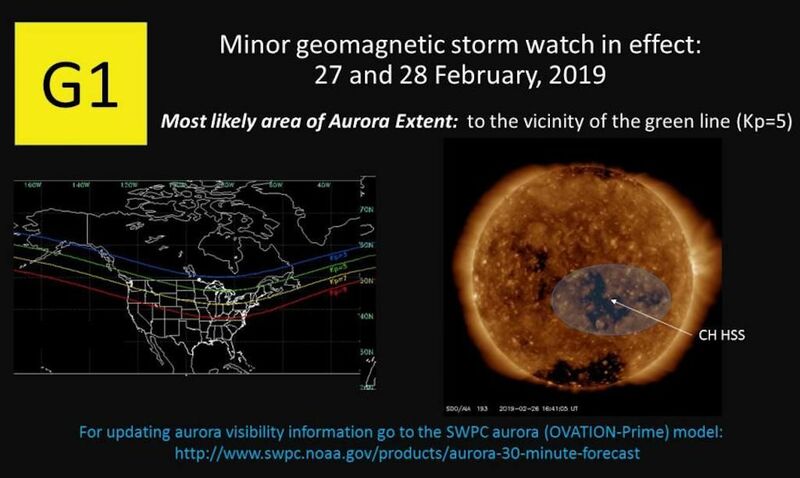 According to the the Space Weather Prediction Center (SWPC), a minor geomagnetic storm watch is in effect for February 27 (tonight) and February 28. The SWPC provided a map that shows where the celestial phenomenon is most likely to occur (see below). According to the map, the northern lights will appear in the vicinity of the green line. That means if you’re in parts of Montana, North Dakota, Minnesota, Wisconsin, Michigan, and Maine, you should be able to see the lights. Those living in parts of Ontario, Quebec, and British Columbia could also be in luck. Check out the SWPC’s 30-minute aurora forecast to know when the best time to get outside and look up is, and as always, you should try to view them from a location with no light pollution.